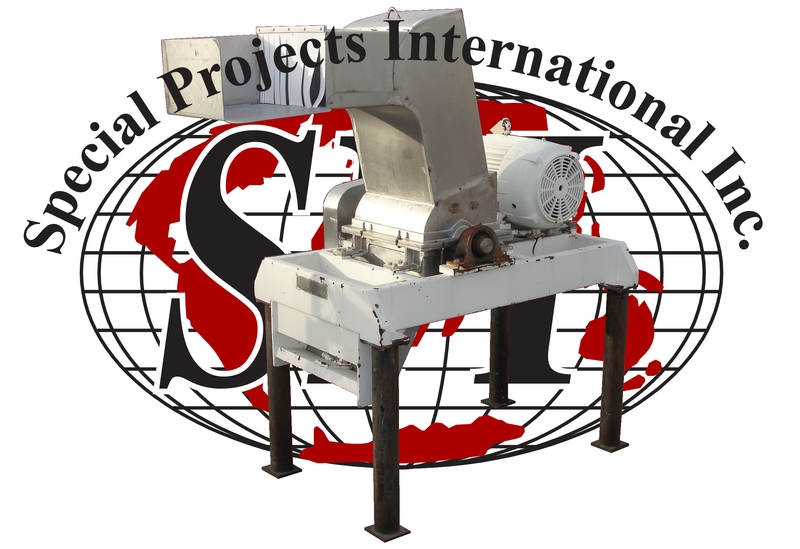 Detroit Tool & Eng Co 100 cuft stainless steel double ribbon blender. 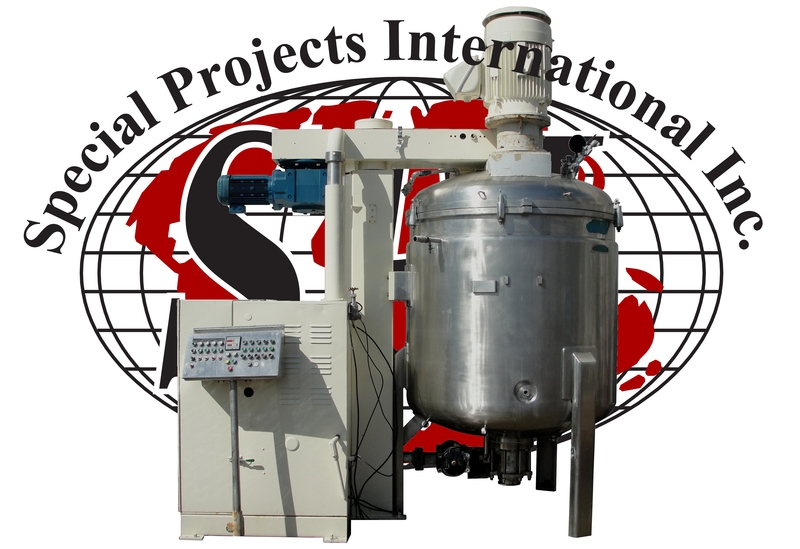 Mixing chamber measures 90″ long x 45″ wide x 55″ deep for a total volume of 100 cu ft. The outer 45″ diameter ribbon and the inner 33″ diameter ribbon are on a 6″ shaft. 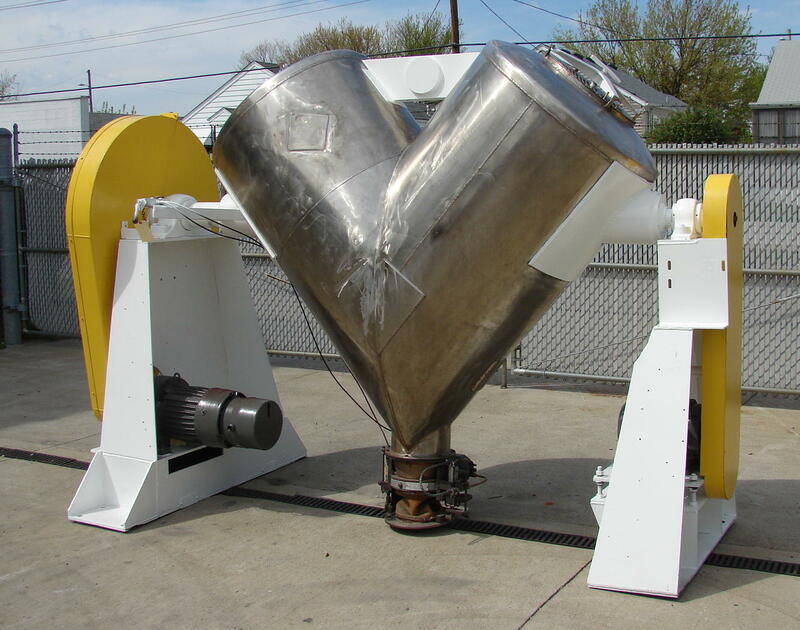 Blender has a 13″ x 13″ inlet on top, a 2″ sanitary Tri-Clamp inlet on the front side, and has a 7″ x 21″ end discharge. Discharge has a manual open/close gate valve. Blender has a half lid. Driven by a 40 hp 1775 rpm motor through a 24.3:1 gear reducer. The overall dimensions are 138″ long x 60″ wide x 78″ tall. Require 230/460 vac 3 phase electrical supply. 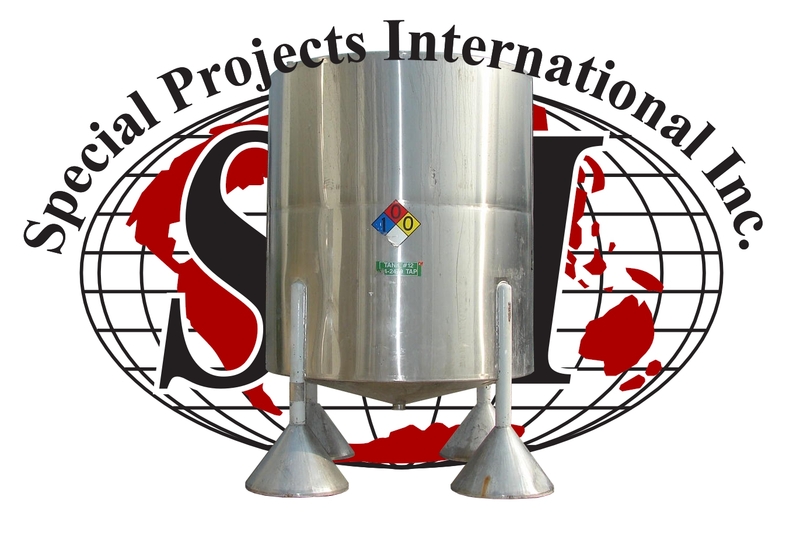 30 cu ft working capacity stainless steel V-blender. Shell is 30″ diameter and 58″ along side. A 3 hp motor rotates the shell. Equipped with stainless steel intensifier bar driven by a 10 hp motor. Last doing iron graphite with a density of 60 lbs/cu ft. This unit is set up for liquid injection. Unit is support on carbon steel stand. Equipped with pneumatic butterfly discharge valve. Requires 230/460 vac 3 phase electric power. Good condition. 10 hp Myers disperser. Serial # 1022. 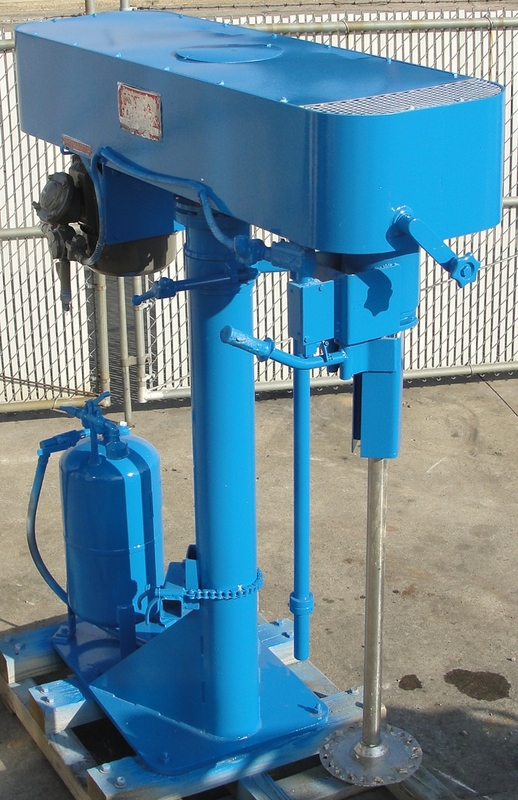 Mixer is equipped with air over oil lift system with 48″ lift. 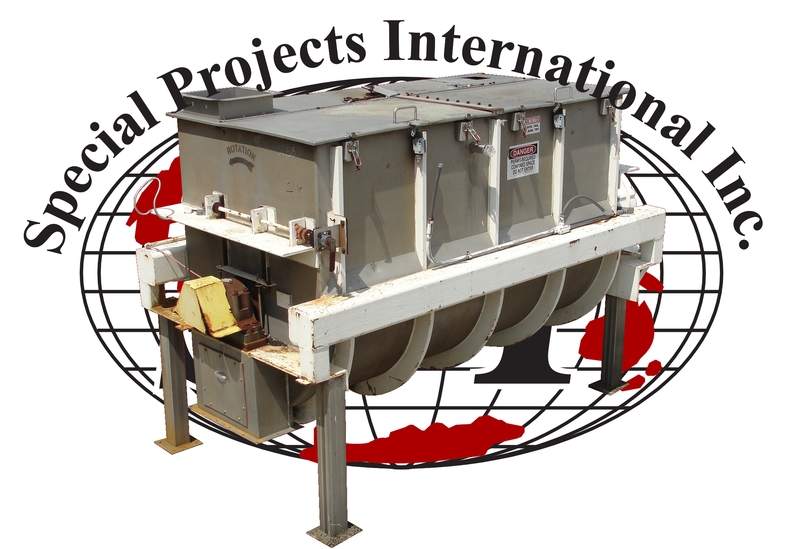 This unit has a 2″ diameter by 43″ long stainless steel shaft and 12″ diameter stainless steel dispersing blade. Mixer uses a variable speed belt drive system. Motor appears to be rated for hazardous locations but tags are unreadable. Requires 230/460 vac electrical supply. Good condition.